Airtel free 160mb for browsing is here again, all that are asking for free browsing, here it comes on your Court. For a while now, there has been a scarcity of free browsing cheat, but luckily another has surfaced. This airtel free browsing selects sim to work on, so give it a trial with all your airtel sim. Although am flexing with mine now, you should also flex with yours. Let's get it rolling. 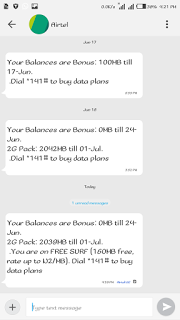 HOW DO I GET THE AIRTEL FREE 160MB? ◾ First of all get your Airtel sim ready for the 160MB. 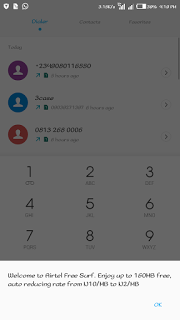 ◾ Next, dial this code *400# on your phone having that your airtel sim is inserted on it already. That's all for that, enjoy while it last. We now have a whatsapp group if you are interested to join then use the comment box to drop your number.